This tip was first published in Safety Fast in 2008. Most of you will recall the correspondence that we had recently concerning the improvements suggested to the clicking noise made for the MGB indicators. During this time Bill Nixson from Jersey contacted me with his suggestions. What fascinated me in Bill’s email was that he had made, as part of his solution, an LED bulb that proved to be highly successful. Later he came back to me with an Internet site that provided 3mm negative earth LEDs (light emitting diode) that fitted the “mes” holder used in each of the instruments of the MGB. I got in touch with Robert Bennett – Managing Director of Ultraleds who proved to be very helpful by providing me with a sample to try in the Boneshaker. 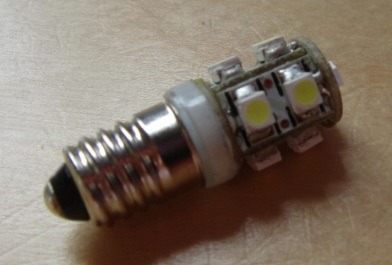 The standard original fit 2.2 watt tungsten bulbs provide a yellow light, which seems to get less bright as time passes. However the 6 LED white wide angle (see picture) replacement produces the equivalent of 5 watts of white light. I fitted my sample into the rev counter and compared the illumination provided during a night time drive, it was apparent that the LED proved to be much better. So much so that I ordered three more, part number U987W, at a cost of £3.50 each and replaced the complete set. Now for the first time I can read the instruments in the dark. Many thanks Bill and Robert.